Slimming effectiveness in 4 weeks on fatty deposits resistant arms , hips, thighs and knees. This treatment is a concentrated serum liporeducing , which, thanks to the specific action of highly concentrated active slimming PhytoTechslim -complex , promotes action at a 360 � localized fat more resistant and helps to fight against their recurrence. Treatment efficacy was demonstrated clinically . Its specific tube with applicator allows direct use on the area to treat , for a targeted slimming action . - It helps to fight against the recurrence of localized fat . It is advisable for women seeking a specific slimming treatment targeted action to address the most critical areas : arms, hips, thighs and knees. Apply 2 times a day on the most critical areas and massage until completely absorbed. 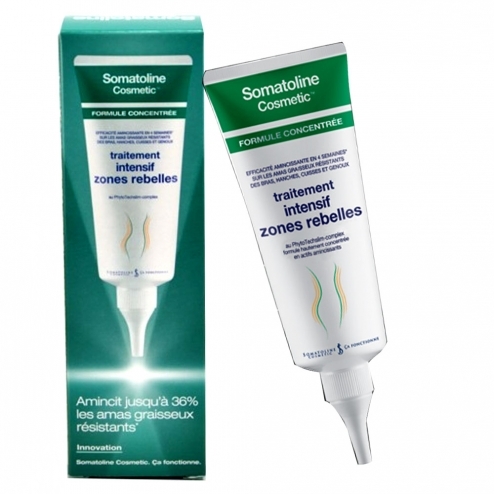 For best results, it is advisable to use Somatoline Cosmetic Treatment Intensive Rebels areas regularly for 28 days. Prolonged treatment after 4 weeks of use helps maintain results . After a few minutes of massage , you may feel a warm sensation , possibly accompanied by tingling and possible occurrence of temporary redness. The occurrence and intensity of these possible reactions , which disappear completely in all cases after 30 minutes, may differ depending on the individual sensitivity of each and are signs of innovative cosmetic product action . These phenomena are transient and should not be confused with an intolerance reaction to the product . If excessive redness, wash with cold water. Wash hands thoroughly after application . External use. Avoid contact with syeux . Do not apply the product on broken skin ( wounds , abrasions , cuts, etc. . ) Or irritated . Thinning is a cosmetic remodeling action which does not include weight loss .